Air Italy Reveals Boeing 737 Max 8 Livery. 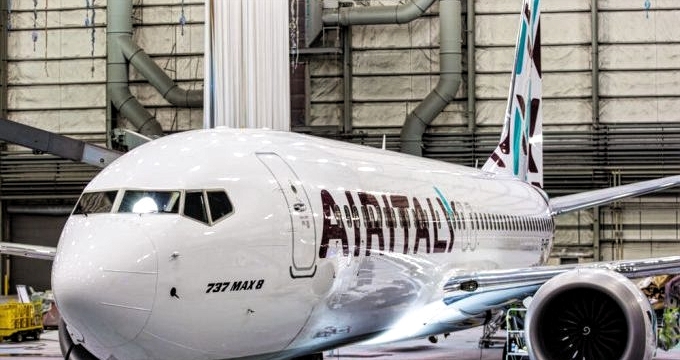 Air Italy has presented, through a publication on Facebook today, the appearance of its first Boeing 737 MAX 8 dressed in the new paint scheme of the airline. The first Italian 737 MAX 8 is almost ready to be towed from the Boeing paint hangar in Portland, Oregon. The new carrier intends to become the new leader in Italy with a new fleet of 20 Boeing 737 MAX and 30 787 Dreamliners. Meanwhile, five ex-Qatar Airways Airbus A330-200 will join the Air Italy fleet, until May 2019, when the first batch of 787-8 / 9 Dreamliners are delivered to the Italian company. The first Air Italy Airbus A330-200 was expected to come out of the paint hangar in Dublin wearing the airline's livery last week. However, the painting work was rejected after a detailed inspection by the quality control department of Qatar Airways. Today, the plane is dressed in a completely white livery waiting for new instructions from Doha. The new decoration shows the typical burgundy Qatar Airways mixed with aquamarine colors in a white fuselage. The Air Italy titles are centrally placed with an attractive tail design that takes the MAX fins as an advantage. The long distance network of Air Italia will be based in Milan-Malpensa (MXP), an airport that was abandoned by Alitalia when it chose to establish its main center in Rome-Fiumicino (FCO). The airline plans to establish an important hub in MXP, with long-haul routes powered by national and intra-European routes. According to Akbar Al Baker, the new Italian airline plans to fly up to 50 destinations within Europe by 2022. The first Boeing 737 MAX 8 will be deployed on national routes from MXP to Rome (FCO), Naples (NAP), Palermo (PMO), Catania (CTA) and Lamezia-Terme (SUF), as of May 1, 2018. In September, the airline plans to connect MXP with Bangkok (BKK) four times a week with the Airbus A330. Stay tuned for more Air Italy developments and live coverage of your inaugural events.